The simplicity of a monochromatic déco r can be stylish and super sophisticated. “The Better Show” recently featured a segment showcasing the latest home lighting trends as shown in the 2013 issue of Lighting Magazine, published by Better Homes and Gardens and the American Lighting Association. A nationally syndicated lifestyle TV show, “The Better Show” focuses on a variety of issues related to home and family life. View the 3½-minute video to get some new ideas for your home. Whether you want to make a few small enhancements to your home’s décor or tackle a full-blown redecorating project, the 2013 Lighting magazine is full of great home lighting ideas and products. For example, proportion is one of the most important factors to consider when designing the light for any room. Big chandeliers can overpower a small-scale space, while a pendant that is too small can feel lost in an expansive ceiling. In a living room, use the dimensions of the space as a guide. Add the length, width and height. 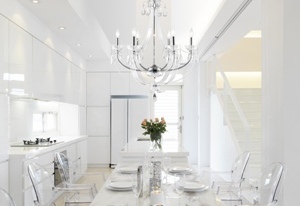 The total should approximate the height in inches of your chandelier. In addition, the bottom of the fixture should be about 78-84 inches from the floor. For more home lighting ideas, you may request a complimentary copy of Lighting from ALA, or simply view the magazine online. Talk to a lighting professional and pick up a free copy of Lighting magazine at an ALA-member showroom. What type of dimmer should I use for table and floor fixtures with LED lamps? Assuming your LED fixtures are medium-based fixtures, your best bet is a dimmer specifically designed for replacement LED and CFL lamps. A few companies, such as Lutron Electronics, Legrand N.A. and Philips, manufacturer those types of dimmers, which can be found at most ALA-member lighting retail showrooms.